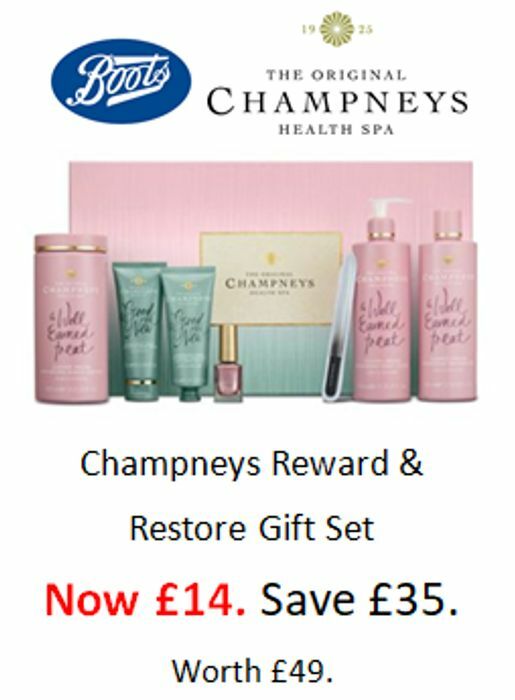 Champneys opened its doors as the UKs first health resort in 1925. Since then we have ensured our guests wellbeing, both physical and mental, is at the forefront of all we do. We know that life is busy and often stressful, which is why we have developed a well earned treat just for you. This gift contains a selection of rewarding bath and body essentials in our fruity Summer Dream fragrance, as well as a harmonious hand care trio to give your hands and nails the attention they deserve. Summer Dream Rewarding Shower Gel 350 ml e 11.8 US Fl. Oz. Summer Dream Rewarding Bubble Heaven 500 ml e 16.9 US Fl. Oz. Summer Dream Rewarding Body Lotion 350 ml e 11.8 US Fl. Oz. Harmonious Hands Restoring Hand Scrub 75 ml e 2.5 US Fl. Oz. Harmonious Hands Restoring Hand and Nail Cream SPF 15 75 ml e 2.5 US Fl. Oz. Nail Polish Shade XVII 10 ml e 0.33 US Fl. Oz. We have 2,877 Boots deals and 182 Boots discount codes on Latest Deals. What do you think of this Boots deal?